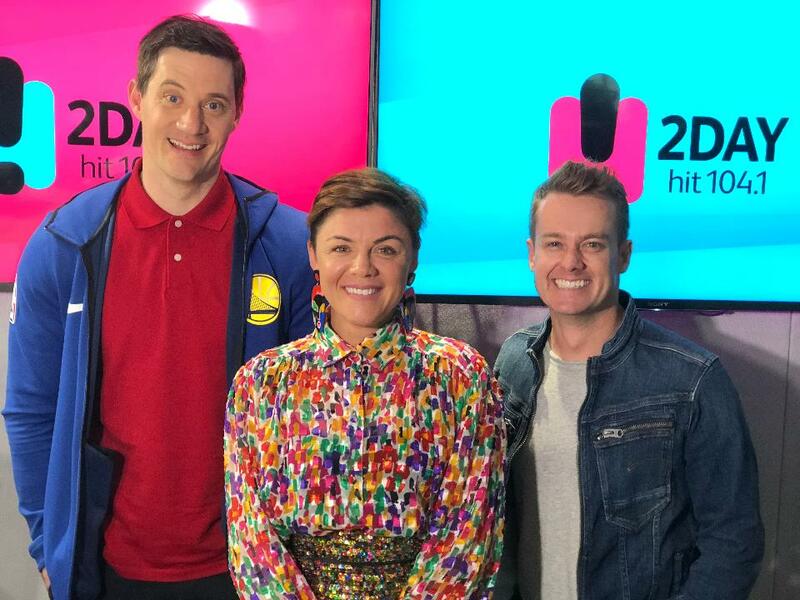 Recently 2DayFM Breakfast host Em Rusciano admitted that she’s “not suited to breakfast radio” and is “hurtling towards an implosion” in the next six months. Following those revelations, reports emerged that 2DayFM Breakfast staff were refusing to work with Em, and have threatened to leave the show. If Em were to depart, who could SCA bring in to replace her? We asked and you answered, and there was one clear winner when it came to finding out the candidate you think could fill Em’s spot on 2DayFM Breakfast. Hit Network National Nights host Ash London came out on top, with almost 24% of the vote. There was also strong support for comedian and no stranger to radio Celia Pacquola, Hit Weekend Breakfast host Tanya Hennessy, and Sophie Monk, who previously co-hosted the show with Jules Lund, Merrick Watts and Mel B in 2014. 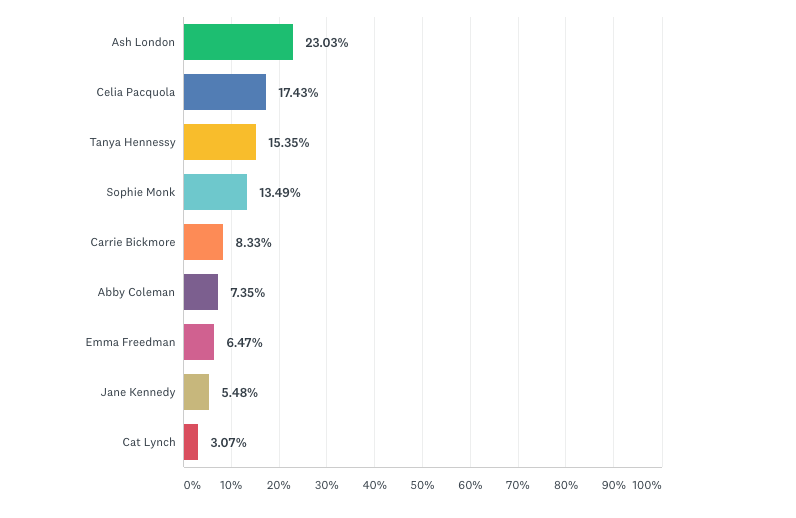 Check out the full results below. Anyone from Sydney would be better! Cat Lynch, it’s a bit of a left field pick but I’ve heard her on Adelaide HIT and she brings more to the table than just a laugh track, might actually give the show a positive relate-able vibe to. She’s active, fun and has a classic Aussie vibe about her that makes you feel like she’s your best mate, would 10/10 recommend if push came to shove. Tony Martin. He has proven chemistry with Ed, and Grant Denyer’s appearance on Get This suggested that there’s probably chemistry there too. I know it’s Sydney and it’s SCA, but why not push a person from within the network? Someone who has grown up in the business, rather than importing a celebrity for a show and trying to make harmonious living. Looking at the top rating brekky shows around the country at the moment (Kyle & Jackie O, Fifi Fev & Byron, Matt Stav & Abby, Jodie & Soda and Clairsy Matt & Kimba), they’re all led by people who have been in the industry for a number of years, rather than just coming in because they showed a little personality during a reality dating show. Tanya Hennessy did amazingly well in Canberra and could do great in Sydney too with her growing social media following, plus she’s someone who knows how to tell a story for radio. But rather than go for someone who showed a little bum on Love Island, go for someone who has already showed you they’ve got what it takes. Bodge!!! (well, HE thinks so). Why are the only options female? There are plenty of females that enjoy shows by males. I would be more than keen to be in the poll. Someone from Sydney would help. You cant have a Sydney breakfast show based in MELBOURNE. Just doesnt work never has never will. Cant see Mr Tony Martin going to SCA whilst certain programmers are still there. he would be great though if they could afford him. Cat Lynch… she’s doing some great stuff in Adelaide and is incredibly real. She also know the market. Time for some new talent!! That’s it??? That’s the list??? Oiiii Vaieee. I’ve just fallen into a deep depression. A few people votng for Cat Lynch. She was a big hit in the morning slot on NOVA 106.9. Her little catch phrase at the start of talk breaks “hello there, Cat speaking” is something people still miss hearing. She’s your real true-blue bonza dinky-di birdyo! Everybody’s mate and loves a Date. So sweet of you Alice, but I genuinely couldn’t think of anything worse. Tony Martin for sure. Best match for ed! To start with get 2 or 3 people who live in Sydney and do a Sydney show. Em should have moved to Sydney for all that money she’s earning. I hear Roseanne is looking for work. Can I get back to you when I care? What is this obsession with needing to have a TEAM of overpaid ‘personalities’ all trying to be funny … when in reality, the humour is minimal … fleeting at best. And virtually every station trying to do the same thing. SO boring. And so needlessly expensive. And most importantly … destined NOT to rate! Blake Phillips give him another chance. I still think Blake Phillips. Everyone in the industry knows that Ed is the star of that show. It didnt work with Em sorry. Grant Denyer has a new TV show so I hear won’t be available some mornings for 2DAYFM breakfast. His first love is TV not radio. That’s a blow. Folks pleeeaase if Em was really committed to Breakfast radio why wouldnt she move to Sydney to do a Sydney breakfast show.